For about 72 hours Alex and I were a team - we left the boyfolk home and went to England to celebrate Langley's 25th anniversary as well as the opening of the Pavilion extension to the restaurant and meet some of the knight finders - see photos on Facebook (http://www.facebook.com/home.php?#!/pages/Langley-Castle-Hotel/51143011126). We did have a tiny bit of extra time to hit the Roman Army Museum, which managed to captivate my 3 year old for more than an hour so I'd say it was a hit. We also got some quality time with my brother and his younger son, whom Alex idolizes. She was thrilled just to watch him play on his game boy! Some photos of Alex and the peacocks, and Harrison in his knight outfit, and a few other things from the trip will be up shortly (I hope ... they will be up eventually, at least). The peacock story is too good not to share. So, apparently, some time in the past a peacock showed up and decided he liked it there. 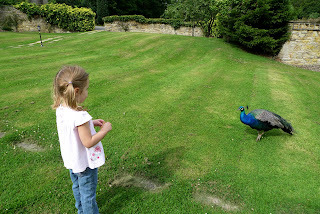 But then he got lonely, so they bought 2 more peacocks (one of which was a peahen, actually) to keep him company. Then mating season came, and now we have 6. It's mating season now and they start calling around 4am. I am shocked guests haven't complained. After a few days of feeding them leftover toast the housekeeping staff informed me they like "biscuits" (cookies) best but even with cookies they weren't letting a 3 year old feed them from her hand. The major downside to the trip was when KLM lost the bag with Alex's car seat in it. Then didn't know when it would be in. Then finally tracked it down after a million phone calls and promised delivery "in the afternoon", although the conversation took place at 5pm so I can't tell when exactly he meant. It was apparently delivered after 11pm but nobody told me when I got to breakfast, so I made 3 more phone calls yelling "where is it" in the morning before I learned it was on site. Of course, by then the only car time left was the drive back to the airport. Grrrrr. KLM has lost our luggage approximately 15-20% of the time we have flown them. Doesn't seem like good stats, and it makes United start looking good again.